Twenty years on from the landmark Bosman ruling, Scottish football is now recovering from its damaging effects, according to Paul Kane. The 50-year-old was the first Briton to benefit from the case, which allowed out-of-contract players to switch between clubs without a transfer fee. "There was a spell when people were buying into the foreigner as the best thing since sliced bread," said Kane. "And that really stunted the growth of Scottish players coming through." Admitting the change in regulations "worked wonders for me", the former Hibernian and Aberdeen midfielder thinks the shift in power to players was too great and is happy to see a balance being restored in Scotland. "There were more players under long-term contracts then," recalls Kane, who moved from the Dons to Norwegian club Viking Stavanger in June 1996. "Players coming to the end of their deals were really interested [in the Bosman ruling], with more money going to players. 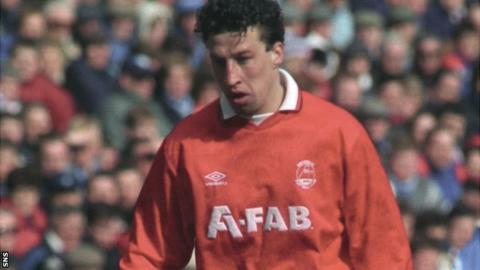 "I'd been fit and ready to go at Aberdeen all season but hadn't played a game under Roy Aitken, so it was great for me. I got out of a bad situation and got a fresh start. "I was 31 at the time. If I'd been younger, I probably would have made a life for myself over there. "When I went to Stavanger, I got a car and a house all paid for. I got a decent salary - a lot better than was on offer in Scotland." Kane only played half a season in Norway and was involved in a wrangle over unpaid wages, returning to spend five years at St Johnstone. "Now we've gone through a cycle and we're nearly back to where we were in Scotland, with a bit more power to the players," adds Kane. "It was all one way for the club, when they could let you go and still lay claim to a fee. Now there's a levelling out in the middle of the market anyway. "Scottish clubs are promoting from within more and transfer fees are coming back and feeding their way down the leagues, which 100 times better." Raymond Sparkes brokered Kane's 1996 move and the agent thinks the Bosman ruling gave players an unfair degree of control. "It offered complete emancipation to every footballer throughout the world," he said. "It certainly did register a complete swing of the pendulum from one extreme to another because the clubs had all of the control, and that wasn't fair, but there is an argument for saying that now the players have most of the control and maybe that's not fair either." On 15 December 1995, the European Court of Justice ruled that players should be free to move when their contracts expired. It also lifted restrictions on the number of European Union players clubs could field in European competitions. "It threw the game into a bit of a tailspin and, notwithstanding the fact that transfer fees no longer existed, it took a wee while for the thing to settle down where it had more of a pattern that we are used to these days," added Sparkes. "It forced the issue that, if you didn't already have the right people in place, then you hired the right people to work your way through the maze of possibilities that suddenly had opened up to you. "The more people that got to grips with solid recruitment, the more successful those clubs were. "We've got a much more sophisticated system in place these days where people like that exist within football clubs to help them get through that. "It was like an ocean liner turning round. It took a very long time for people to see the advantage of it all."